I'm sorry I have been quiet this weekend I went home to Sussex and my laptop there was broken so I couldn't upload any pictures and blog boo. But I was so busy this weekend, as my best friend was round all weekend and I was spending time with family that I would of blogged little anyway. But on Friday I went shopping to good old Brighton with my mum, when I of course went straight into Zara and this gorgeous bag caught my eye. This was the only one in this colour so I grabbed it straight away as I knew that it had to be mine! 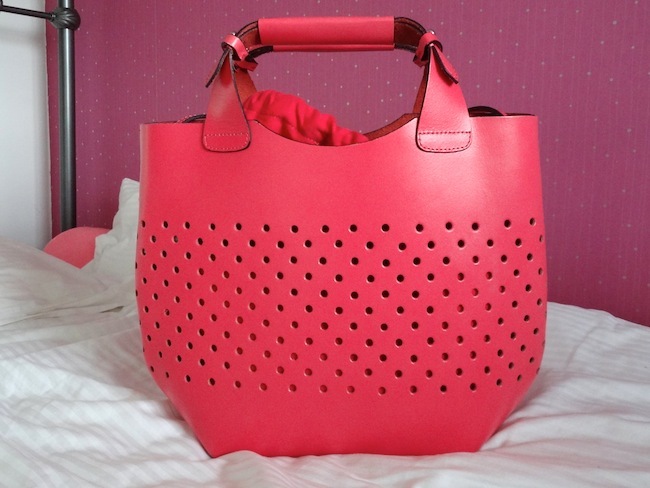 This colour is so me I love coral, in the photo it looks more pink but it is more a pinky coral shade, and is the smaller size than the large popular bucket tote. It comes with a long strap as well so I can wear it on my shoulder as well as holding it which I love! For me this is the perfect summer bag, I can't wait to wear it with a floral dress and denim jacket or a simple pair of jeans and white t shirt. I got this as a birthday present but I have to wait 3 weeks until I can use it booo, I suppose if the weather stays rubbish like this it softens the blow haha. This bag comes in navy, orange, yellow and teal, have any of you got a bag from Zara recently? this bag is absolutely lushh!! Thank you! :) need some sunshine now to wear it!